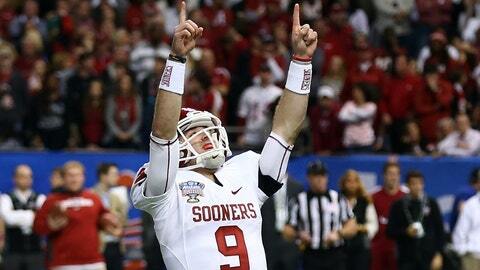 Sooners QB Trevor Knight had four touchdown passes in a 45-31 win over the Crimson Tide in Sugar Bowl. Come on, be honest: Oklahoma putting a 45-31 beat-down on Alabama in the Sugar Bowl? Sooners quarterback Trevor Knight, a freshman who had only thrown five TDs in his college career entering Thursday night, outperforming Crimson Tide QB AJ McCarron, a two-time national title champion and Heisman finalist this season? An SEC juggernaut — a national juggernaut — finishing the season not only by getting bumped out of the conference championship game but faltering against a Big 12 team that had lost to Texas by 16 points and to Baylor 41-12? One sign the game wasn’t going in the Tide’s favor was the look of concern Katherine Webb wore from the stands at moments on Thursday. The game wasn’t the ideal culmination to McCarron’s career. Despite throwing for 387 yards and two TDs, he was also picked off twice in addition to the fumble. But is a loss really the worst thing in the world for Alabama and Nick Saban? 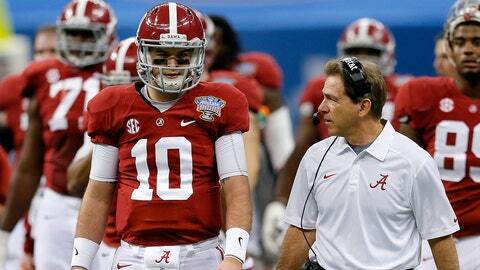 The Sugar Bowl marked the final game Saban will coach McCarron at Alabama. Last month, Alabama coach Nick Saban agreed to terms with the university on a multi-year deal that pays out a reported $7 million annually. Regardless, speculation that Texas still may be able to woo him into replacing Mack Brown in Austin has only slightly lessened. (A) Enduring his first multi-loss season since 2010 could persuade the Crimson Tide head man to stay in Tuscaloosa, fueling a renewed sense of purpose to further improve the program. Could falling to Oklahoma, a team Texas beat less than three months ago, even lower his coaching stock for the Longhorns job? (B) Or the defeat could be taken as a sign that it’s time to move on and start anew in Texas. A program in the Longhorns’ state would kill for a 11-2 record. Texas has endured at least four losses each season since they went 13-1 in 2009-10. Prior to the Sugar Bowl, Knight had all of one three-TD game to his credit. That was back in the first week of the season against Louisiana-Monroe, a team that ranks 84th in the NCAA for average points allowed per game. He threw four TDs Thursday night. His performance in only the fifth start of his career was deemed good enough to name him Most Outstanding Player in New Orleans. “I think it’s huge for our program,” Knight told ESPN in an on-field interview. “To get a win like this after nobody gave us a chance throughout the year, playing all three quarterbacks, it’s testament to Blake [Bell] and Kendal [Thompson] just sticking it out, and myself as well. "You know, we’ve got to ride this into next year, we know we’ve got a lot of guys coming back, but we can’t settle with this. We want the main goal and that’s the big one." Coach Bob Stoops may have proven that his team can compete with an elite SEC squad, but can he take OU to the next level in 2014? Sure, McCarron’s been a stud leading the Tide on the field, and over the past two seasons he’s thrown a touchdown-to-interception ratio of 58 to 10. But one of the coolest moves he’s made: wearing bowties for a charitable cause on game day. It’s been a thoughtful recent tradition for a guy who has a bright future ahead of him. Below are just a few of the ties he’s donned this season, with accompanying explanations by McCarron for why he decided to wear each one.